I was on the team that analysed UK GCSE Science questions from Summer 2008. It was a depressing experience - and our findings made for sorry stories in the media. In practice, the outcome should have surprised no-one; the Royal Society of Chemistry have been making warning noises for some time. One of my colleagues on that team was Ken Zetie who is Head of Physics at St Paul's Boys School in London. He set one of the GCSE papers to his son, aged 8, with the inevitable discovery that, yes, even a child could do these exams. He also reflected on the experience here. One particular discovery we made was that a number of questions were accessible to candidates who had not even studied the subject. Other questions required little understanding - simply the ability to plug numbers into a formula. Now consider that in some subjects, languages for example, candidates are allowed reference materials such as dictionaries. 1. Can the question be done without the candidate having been to lessons at all ? 2. Can the question be done by simply rearranging information available from the exam paper itself (eg: plugging numbers into a given formula) ? 3. Can the question be done (in the time available) if the candidate has access to Wikipedia ? 4. Can the question be done (in the time available) if the candidate has access to WolframAlpha ? (If you haven't yet tried WolframAlpha then you really, really need to click on that link. Or this one). 5. Could you only do the question if you had a genuine understanding of the subject being examined ? Well, presumably ALL exam questions should be written to meet level 5 ? 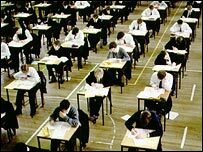 Unfortunately, even a year on from our depressing experience, it seems the UK exam boards have yet to rise to the challenge. The latest "re-writes" are still regarded as too easy. But, looking to the future, what does this mean for the future of education in the face of Moore's Law and ever-improving "Knowledge Engines".